We source superior quality textiles, create beautiful, inspiring designs for your home, and bring unparalleled comfort and beauty to your home. The color palette is created with flexibility of use and timeless desirability in mind. Our intent is that the user will keep the pillows for a life time and that the piece will adapt to the users ever changing needs and tastes. For us, the greatest appeal is the fact that each and every pillows is unique and unlike anyone else's. We select the finest, antique textiles for our pillows. These textiles are reverently sourced, from auction houses to antique markets. Sourced from around the world, many of the linens are over 100 years old and represent some of the finest and most imaginative damask patterns of their time. They include an array of motifs, from Provencal, Egyptian, and Greek, to ornate florals and botanicals. 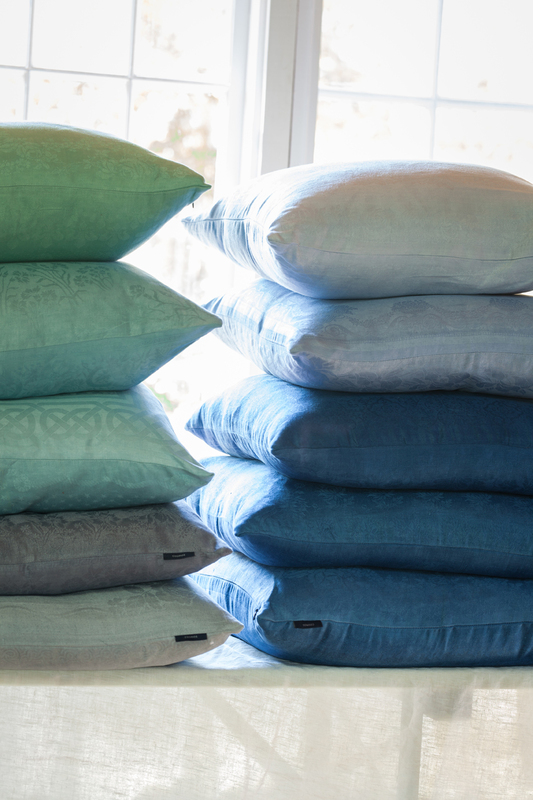 Each pillow is hand-dyed using a fiber reactive dye process. The color is chemically bonded to the fabric. The color will fade if bleached. The color will fade when exposed to direct sunlight for a prolonged period of time. For example, sunlight reflected through a window can fade the color over time.